Be sure to visit all the Monochrome Weekly participants here. This is a wonderful shot.. very nice! I also use Picasa..and think I will continue to, while learning about Adobe Elements, very time consuming!!! Very nice and cool shot. The leaves are almost transparent due to lighting. 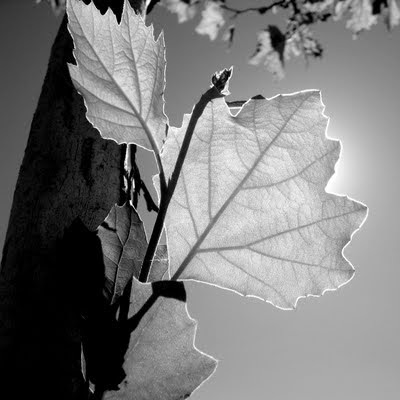 Every leaf has a silver lining - lovely image. Very pretty, it's fabulous how the sun through the leaf really accents the veining. I like the way the light lines the leaves. I love leaves! Wonderful shot!